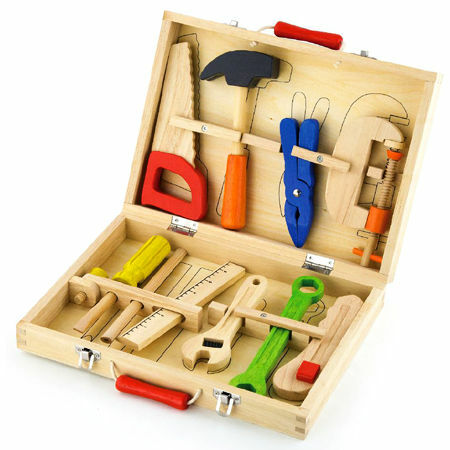 Toy Wooden Carpenters Set is a wonderful wooden toy with everything a little carpenter could need. It is presented in a hinged wooden case with a closing latch and carry handles. There is a place for each tool with a corresponding outline for matching and pack-up time. Saw, Pliers, Ruler, G-Clamp, Stanely Knife, Screwdriver, 1 x Wrench, 1 x Spanner and Hammer. The case itself has moving arms that hold the tools All can be closed and latched shut. There is even a rope and wooden handle so you can carry it between jobs. A brilliant toy! Size: 29cm x 21 x 5.5cm. We like this because: "Packing and un-packing it is as much fun as your pretend woodwork. "